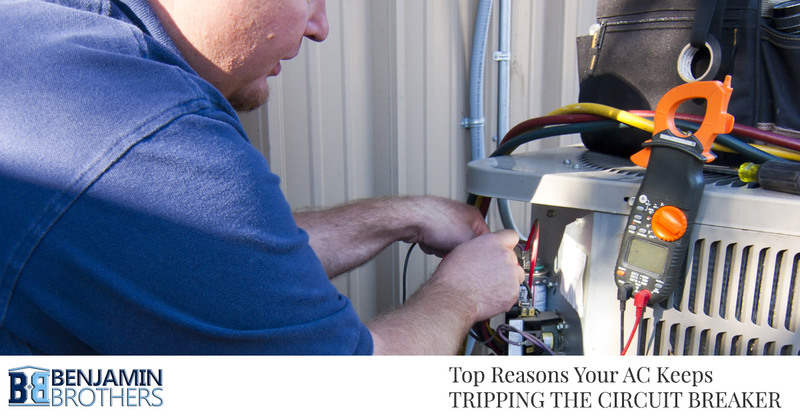 Once you’ve located the source of what has been tripping your breaker—your air conditioner—you might be wondering why that is. The great news is, we have the answers! Read on to learn more, and contact Benjamin Brothers today for your air conditioning repair and replacement services. Air conditioning units tend to trip the breaker because it is using more amps than the breaker can provide without being overworked. For example, if your 20-amp breaker is powering your 30-amp air conditioner, you are going to have a problem with the breaker tripping! This is good news, however. If the breaker didn’t trip, the overcurrents would damage your equipment and could even set your home on fire. We recommend not resetting the breaker and letting it trip time and time again because this WILL eventually lead to damaged equipment, a fire, or both. So what is causing this issue in the first place if the AC runs for a bit without much of an issue? There are a few causes: a dirty air filter, a dirty outside unit, an issue with the circuit breaker, a shorted motor, a compressor that is having a hard time starting, or a compressor that is grounded. If the air filter is dirty, then that means an easy fix for you! However, any of the other issues will require one of our professionals to come and handle the situation for you. Imagine sitting in front of a dusty fan. Unpleasant, right? Now imagine that fan is caked in dried mud. We can’t imagine that much air would be getting through, and the air that did probably wouldn’t be feeling all that great. Your dirty filter blocks air from getting through your AC blower, and the blower has to work even harder and longer to get any air through the filter. This makes it demand more electricity and lead to the breaker being tripped. Changing the filter is all the fix you will need! Every AC system has an inside and an outside unit. Your inside unit absorbs the heat from your air using the refrigerant in its system. This refrigerant travels to the outside unit to disperse the heat. However, the outside unit is not going to disperse the heat efficiently if it’s dirty. Dirt is an insulator, so the AC runs until it can get the heat out unless—you guessed it—the breaker trips from too much electricity. All you need to do is get an AC tech to help you clean the outside unit. They have special chemicals and equipment to handle your unit without damaging it, so make sure not to do it yourself. Your air conditioning unit might be just fine, but the breaker may not be. If the wires connected to the breaker somehow get loose, or if the breaker itself if just old, some work needs to be done. The good news is, this is not an expensive fix! Just have a technician tighten the connections to the AC’s breaker or replace the breaker entirely. The electric motors in your AC run for hours on end, and they often receive quite a bit of abuse as times goes on. This becomes a problem when the motors are running hot for too long, as this can cause the wire insulation to break down. This causes an electrical short, which is where electricity skips its normal path and take a shortcut. The shortcut allows for more electricity to flow than the wires can take, making the wires overheat, melt, and cause a fire. The good news is, the circuit breaker should trip before a fire can start! Contacting an AC technician and having them come out to take a look at your system is the best way to know if the motors have shorted. The central part of your air conditioning is the compressor. This needs a bunch of electricity when it starts. The problem is, as this compressor gets older, it has a harder time starting and has to pull even more electricity. This leads to the breaker tripping as a result. You can have a technician install a hard start kit which can help the compressor get started without as much trouble. However, sometimes a compressor is just too old or damaged to have a kit installed. When this happens, you will need to have it replaced instead. The term “grounded compressor” is used to describe the electrical wiring inside a compressor that has broken and damaged the side of the compressor. This leads to a short to ground, which ignites the oil and causes a burnout. The sudden surge of electricity also trips the circuit breaker! This is the worst possible cause, as the technician will need to replace the compressor and clean the refrigerant lines. If your compressor is out of warranty, it may be worth it to just replace the whole AC unit. When it comes to difficulty with your commercial or residential air conditioner, it’s time to contact the professionals at Benjamin Brothers. Our team of experts can help your resolve your issues quickly and efficiently! No more getting stuck in an overheated home or business; call us today. We proudly serve both Pasco County and Hillsborough County, so allow us to be the first team you call.